Over the last few years I’ve been lucky enough to be involved with the annual Taste of Kent Awards, which has given me the most wonderful opportunity to try the ever increasing range of great produce coming out of the county. And the category that just keeps getting better and better is the cheese and dairy section. Here in the south of England with the lush grass and temperate climate, local cheesemakers are really coming into their own. Cheeses have walked off with the top prize in the awards for the last two years – in 2013 it was the magnificent Winterdale Shaw, a hard cheddar made from unpasteurised cow’s milk by Robin Betts, a talented family farmer based outside Wrotham. (Not available at Penshurst but make sure you try it when you see it!) And Karen and Steve Reynolds of Kingcott Cheese make the sublime Kentish Bluebell, with milk from their dairy herd just outside Staplehurst, which won the overall prize in 2012, and is one of my particular favourites for a cheeseboard or to cook with. All of which means that I will once again be putting together a local cheeseboard this Christmas to round off the big meal but also to bring out over the holiday. It makes a good talking point as these cheeses more than stand up alongside the traditional favourites such as Stilton. And if you are visiting friends for the holiday and not cooking this year why not suggest you bring along the cheeseboard as a very welcome gift. In fact there are so many wonderful local cheeses to choose from that selecting for a board can be confusing. The answer is to keep it simple. I tend to serve just two or three really good cheeses or five at the most, as any more will overwhelm the palate. Also I like to serve generous wedges that look appealing on the board rather than little slices. Any leftovers that aren’t eaten later will be used for cooking, and if I have more than I need then I just crumble up the cheeses and freeze for later. I’ve included two of my favourite recipes for using up leftovers here. Here is my selection of cheeses that I can buy at Penshurst farmers’ market, or at cheese counters such as Faversham’s Macknade’s or the Goods Shed in Canterbury. For your three cheeses, pick a firm variety, such as a cheddar, a soft cheese and a blue-veined one to give a variety of tastes and textures. 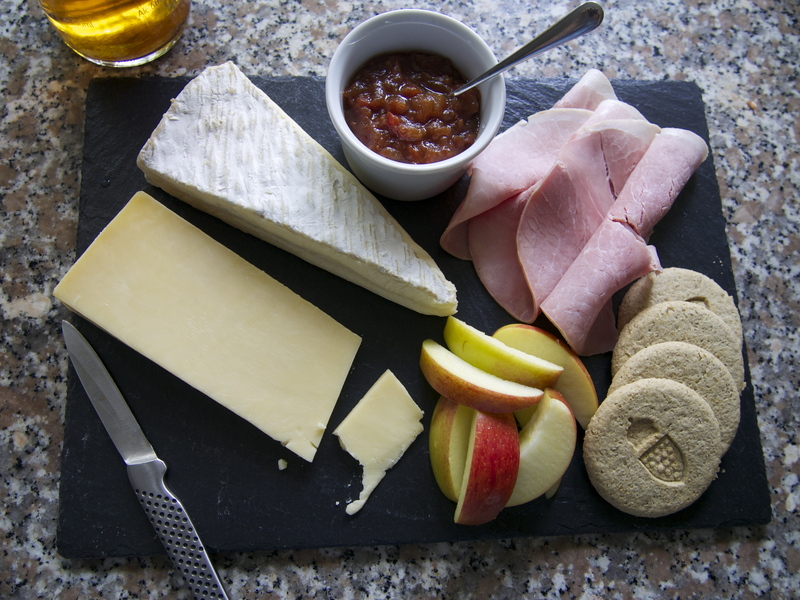 You need to allow about 75g (about 3oz) of cheese per person for a cheeseboard at the end of a meal, or 100 – 150g for a supper or in a ploughman’s when I serve my cheeses with good bread, biscuits, a salad and range of chutneys or Wild at Heart’s excellent Chilli Jelly. Winterdale Shaw is a really outstanding cheddar style cheese that has been winning awards around the world and is made by a family of farmers who go back hundreds of years but have only been making cheeses since 2006. It’s intense, creamy and beautifully balanced and matured in a cave set in the chalk hills of the North Downs outside Wrotham. Broadoak Cheddar from The Traditional Cheese Dairy in Stonegate, East Sussex, is a cow’s milk unpasteurised cheese traditionally bound in double muslins and matured for a minimum of 12 months. With the good balance of acidity and maturation period, it is a satisfying cheese with a clean, sharp edged flavour. Both are perfect for the cheeseboard and for cooking in recipes such as the wonderful Kentish cheese fondue I came up with for beer day at a recent market (see below). Kentish Blue and the award winning Kentish Bluebell are unpasteurised blue cheeses, handmade by Steve and Karen Reynolds on their family-run dairy farm just outside Staplehurst, in the heart of the Kent countryside. The cheeses are made with milk from their own farm-assured, closed herd of Holstein Friesian cows. The milk travels a mere 20 metres from the milking parlour to the purpose-built cheese dairy, and as it is used immediately, there is no need for it to be cooled for storage or reheated before cheese-making begins. Made in the traditional way, with vegetarian rennet, the cheeses are turned regularly to allow even distribution of moisture and blue veining. It is pierced by hand to allow the blue to develop and then matured for around three months. I love it for the sharp intense but buttery flavour and creamy texture which works so well on the cheeseboard but also in recipes such as my Blue cheese and celeriac soup that went down so well when I served it up at last year’s Christmas market at Penshurst. Cheesemakers of Canterbury make the award winning Bowyers, a Brie style pasteurised soft cheese made from cows milk which is creamy and perfectly balanced. Saint George is a Camembert-style goat’s cheese from Nut Knowle Farm, made from the milk from pedigree British Toggenburg and British Saanen goats on their farm at Horam in East Sussex. Their goats are fed a natural diet of cereals and meadow hay and are milked twice daily. Goats respond to kindness so at Nut Knowle each goat is known by name and number, fed on natural cereals and meadow hay and milked twice daily. This care ensures the quality of the delicately flavoured milk, necessary to make the renowned cheeses. This creamy cheese is kept in the maturing rooms on the farm for about two weeks. It can be eaten young or, left to mature, will develop more flavour and ‘run’. A soft goat’s cheese from Nut Knowle Farm, marinated in herbs and oil in four flavours. It comes with peppers, herbs, chillies and spices in attractive sealed jars and makes a wonderful Christmas gift. Made from pasteurised goats milk and suitable for vegetarians, it is ideal for cooking or the cheeseboard. Take the cheese out of the fridge two to three hours before serving to allow it to come up to room temperature so the flavours can develop. If cheese is too cold, its flavour won’t come through. Remove all wrapping before serving but leave on the rinds to preserve the shape of the cheese and make it look its best. A cheese’s flavour develops from the outside in, so the rind is there to help it develop this fully. Rinds can be safely eaten on most cheeses (not waxed ones!) but it’s really a question of personal preference. Serve your cheeses with walnut bread or a sour dough bread, a selection of biscuits (I like oatcakes) and a locally made chutney or quince cheese – there are plenty of all of these on sale at Penshurst. Serve on a large wooden cheese board and ideally use a separate knife for each cheese. Add grapes, apple, or celery to your cheeseboard – they add colour and freshness, complement the cheeses and also clean the palate between each one. Store your cheeses in their original wrappers in the fridge or a cool larder if you have one. Once opened, wrap any leftovers loosely in plastic film or waxed paper and store back in the fridge for 5 to 8 days. You can freeze any bits and pieces for cooking with later but remember delicate cheeses will lose their flavour after a month in the freezer. Keep stronger cheeses for up to 3 months. 1 Rub the inside of a cast iron or earthenware fondue pan with the cut side of a clove of garlic then chop up the garlic and add to the pan with the beer, lemon juice and mustard. Bring to simmering point. 2 Add the grated cheese and stir over a low heat until melted but don’t allow to boil. Mix the cornflour to a paste with a little water or beer and add to the mixture. Heat it gently on the hob, stirring all the time, until it starts to bubble, and all the cheese is melted and silky smooth. 3 If the fondue is runny, dissolve another teaspoon of cornflour in a little beer or water and add, stirring continuously until the mixture thickens. If it’s too thick, add a splash of beer and stir. Season and serve with plenty of bread to dip into the hot cheese. 1 Heat the butter in a large pan and add the onion and garlic. Cook for 5 minutes until softened and golden then add the cubed celeriac and toss in the butter for a minute or two. Add the vermouth and stock and bring to the boil. Simmer for 15 minutes until the celeriac is tender. 2 Puree the soup with the cheese until smooth then return to the pan and heat through but don’t boil. Check seasoning. 3 To serve, dry fry the bacon cubes and diced apple in a small non -stick frying pan until crisp and golden. Serve the soup in warm bowls with a dollop of crème fraiche and the bacon and apple scattered on top. This entry was posted in Farmers Market, In season, Kent, Local food, Recipes and tagged Bowyers Brie, celeriac soup, cheese beer fondue, Cheeseboard, Cheesemakers of Canterbury, choosing cheese, Hepworths, Kent cheeses, Kentish Blue, Kingscott Cheeses, Lord of the Hundreds, TAste of Kent awards, Winterdale Shaw. Bookmark the permalink.